In long distance driving, it's helpless when our phones or laptops run out of batteries while there is only ordinary charger on hand. Most cars don't equip with AC 110v/220v power supply. In such case, a power inverter works with the car will absolutely keep such awkwardness away from you, a car power inverter will convert 12v DC to ordinary 110v (or 120v, 220v, 230v, 240v) AC to feed regular power source to small household appliances. But, there are lots of things we need to pay attention when we use a car inverter which are not well known by us, hence, GoHz issue this buying guide for you to select a right power inverter. We all know, no matter what price, no matter what brand of car, it's equipped with one or more 12v power, the 12v DC power supplies usually use for cigarette lighter, tachograph or some other devices. But these power supplies' voltage is very low, and it's DC power, they can not be used for ordinary home 110v/220v (120v, 230v, 240v) AC appliances, like laptops, hair dryers, phone chargers. So, you just need to buy a power inverter for car to power such appliances from 12v cigarette lighter power supply. How to choose a right car power inverter? There are plenty of power inverter brands in auto parts streets, electronic retail shops and online shops, cost from tens to hundreds of dollars, or even thousands of dollars. And the power capacities from tens to hundreds of watts, to thousands of watts (kilowatts). 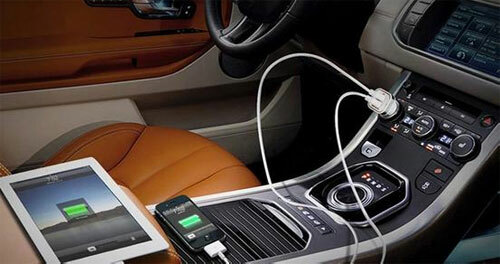 Then, how can we choose the best power inverter for our cars? Here are some tips we can follow. 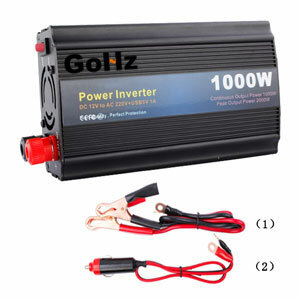 For regular home users, buying a car inverter maximum power limits below 200 watt is completely sufficient. Because the vast majority of family cars 12v power supply secure current is less than or equal to 20A, that is to say the maximum allowed appliances are approx. 230 watt, and some old cars allowed secure current is even 10A only, so we don't have to purchase a high capacity power inverter for your car. 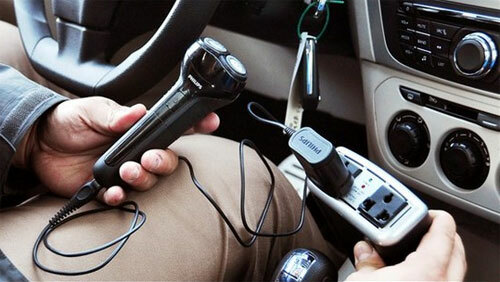 Currently, most 12v cigarette lighter connected car inverters are used for electrical appliances less than 150 watt. For some outdoor workers, or need to use high-power electrical appliances, can select the battery direct connected power inverters. Such car inverters can supply 500 watt or even higher power, it can drive some small motors and 1000 watt or higher power devices. To the types of car power inverters, in addition to the traditional materials and brands, they have big difference in performance. At present, there are two main types of car inverters are pure sine wave inverter and quasi-sine wave inverter on the market for sale. Wherein the pure sine wave inverter price is higher, basically the price is from 100 dollars to thousands of dollars, the performance is very good, the quality of the output electricity is even better than our regular AC grid power 110v (120v, 220v, 230v, 240v). The quasi-sine wave or modified sine wave inverter is cheaper, it belongs to the class of square wave inverter, in most cases the stability can be guaranteed, it's the cost-effective car power inverter for the buyers. The fuse of automotive 12v DC power supply can not withstand high current, of course, this does not have a unified standard, in most cases, cars will be designed for the maximum allowable current at 15A or 20A. There are also few cars, especially some old cars, use 10A fuses. So, when we use the power inverter for car, we need to know that the value of the fuse of the 12v DC power supply maximum allowable current, do not blindly buy a high power inverter, or use high-power electrical appliances, otherwise, you will burn your car fuse without any other benefits but cost more. In our daily life, the digital devices such as: cell phones, xBox 360, cameras, laptops, tablet computers, shaver and so on, the consumed power during charging is very low, as low as 100 watt or even less. But some other heating appliances like hair dryer, heater, electric hot water bottle, etc., will consume as high as 1000 watt or more, which is absolutely not be connected to the car power inverter. Some of us may be worried about, if the current is too high when using the car power inverter, in addition to the car inverter and 12v fuse, does it also burn or affect other appliances? In theory, every appliance inside the car is in parallel circuit, so it just affects the use of 12v DC power supply when the fuse burnt, other appliances will not be affected. Currently, there are some cheap car inverters on the market, due to the material cost limitation, the output 110v (120v, 220v, 230v, 240v) AC power is not pure sine wave, but modified square wave or quasi-sine wave. The negative effect is, it has big impact for nickel-cadmium battery charging and discharging. Typical devices with nickel-cadmium batteries are shavers, rechargeable flashlight, portable battery packs, etc. There is a commonplace thing, a lot of "old" vehicles, the automotive 12v cigarette lighter power supply does not automatically cut off after the car parking. Because the power inverter itself is an electricity consume device, if the car 12v power supply is not cut off, the power inverter will exhaust the batteries even if there is no appliance connect to the inverter. Now, what we can do for high-power electrical appliances? In fact it is easy. We can connect the power inverter to the car batteries directly when we use high-power electrical appliances (generally more than 150 watt). But need to pay attention to the battery capacity, do not exhaust the battery out to avoid the car can not be ignited. Power inverter is not the common used vehicle device, not well known by car owners. Some people just buy an affordable car power inverter and plug whatever appliances to it, which has a lot of hidden security risks. In fact, as ordinary family car users are rarely use power inverters in daily life, because most of the time we can charge the phone by connecting 12v car power supply directly. 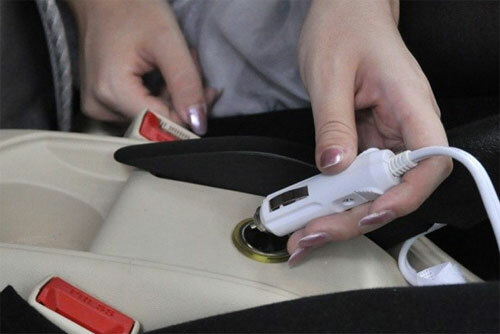 Only in the long-distance traveling by car or some special time, the power inverter appears as an "emergency electricity converter", but as it is not commonly used, some people were not get emergency electricity successful but burn out the fuse instead. 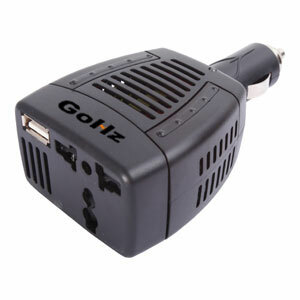 GoHz.com hope this buying guide and tips can give you a correct understanding of the car power inverter and make it work properly. 600 mA. Not sure what all that means. Hope you can help. This is very precise and useful and Comprehensive. Thank you. Thanks for you detail guide. After reading the whole guide, I have mastered several points about how to choose a good power inverter. Before reading your post, the only experience to me about power inverter is to use bestek 400w power inverter to charge small lights when holding a party in the forest. From now on, I will consider more about how to buy a good power inverter.